Last night, I went to Falling Rock Tap House in Denver with my wife to meet up with some of her friends from professional development program that she took part in two years ago. We had originally planned to eat at Cilantro Fusion and then head to Falling Rock for a few beers but were met by a dark store front with a sign in the window that indicated Cilantro Fusion would be closed the week of September 13. Their website states that they will be closed the week of September 26. I definitely got the feeling that they haven't been open a while. This is unfortunate, as we were really hoping to try their modern Mexican cuisine. We ended up grabbing a bite at the tap house before our companions joined us. The food was just ok, but I don't think people frequent Falling Rock for the food. My wife ordered the Black 'N Bleu Burger while I had the Cordon Bleu. The burger was every bit blackened with its its overabundance of Cajun spices. The large hand-breaded chicken breast on my sandwich was crispy on the outside and tender on the inside and complemented nicely by the swiss cheese and bits of ham. We both much preferred the chicken to the burger. Unfortunately, the fries that accompanied each sandwich were soggy and unappetizing. Good thing the main course was the beer! With over 200 beers to choose from, and the selection changing weekly, everyone's taste buds will find suds to their delight! Along with the beer selection, the atmosphere is second to none. Large wooden booths and leather arm chairs make this pub a great place to relax with friends and enjoy a few pints. You can spent hours simply contemplating the plethora of beer bottles and taps lining the walls. Falling Rock is definitely a beer connoisseur's dream come true. I went with an all-Colorado themed night of dark brews to go with the cool beginning of autumn with draughts from Avery, Left Hand and Odell. 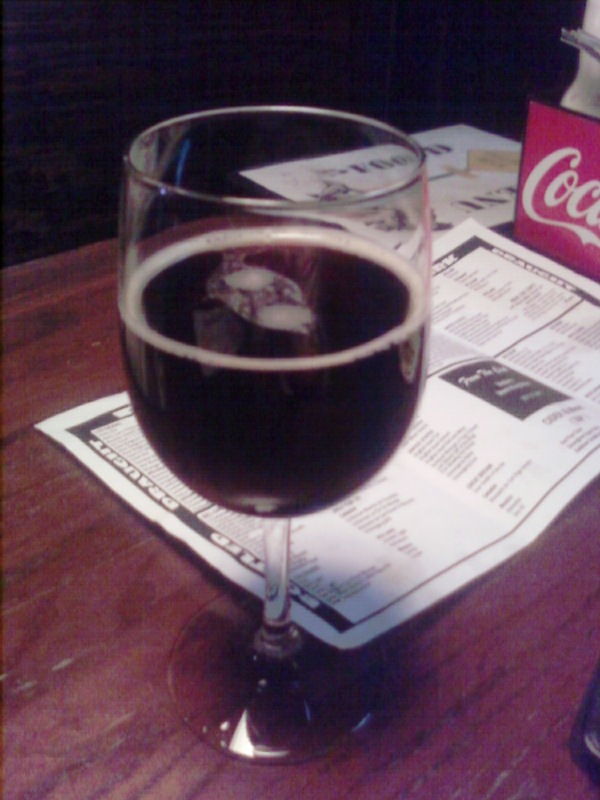 Served in a wine glass, this brown ale may not please everyone's tongue. Using a yeast that is often the bane if a winemaker's existence, Brettanomyces, this brown ale is transformed into a sour brew that is reminiscent of English Porters from the 19th century and traditional Belgian ales. Brett, as the yeast is colloquially referred to, is usually considered a fault in most wines but also is the diagnostic characteristic of some wineries, such as the eponymous Château de Beaucastel. To me, the Saboteur tasted of earth and vanilla with a slight sour component that Odell's describes beautifully as pineapple. So think of your favorite strong dark brown ale with a shot of pineapple juice in it and you you are on your way to tasting Saboteur. One of my favorite beers is Left Hand's Milk Stout. I have had the bottled version of this beer many times before. However, I had never had the nitrogen version previously. Most draught beers are dispensed using carbon dioxide to maintain the carbonation in the beer. However, some beers, most notably Guinness, are dispensed using nitrogen which creates a smoother creamier pour with a dense foamy head. I definitely have a renewed appreciation for this fantastic stout. The milk sugars provide a sweet creaminess to this dense dark brew. The nitrogen only amplifies this creaminess and makes this stout all that much better. This single-barrel experiment is one big bad beer! The 50% Out of Bounds Stout and 50% Mephistopheles' Stout aged in a Heaven Hill bourbon barrel for six months will knock your socks off. This black beer delivers a thin dark-brown head and releases aromas of caramel, espresso and bourbon that you smell even before it gets near your nose. This one is a sipper because it tastes like a shot of espresso and a bourbon with a dollop of molasses merged together. It is a hot beer that is surprisingly contains only 10% alcohol. Good to warm your soul on a cold evening but not for the faint of heart!